Apps keep crashing on your iPad? Try clearing the memory. We actually recommend our folks do this prior to any major presentation. 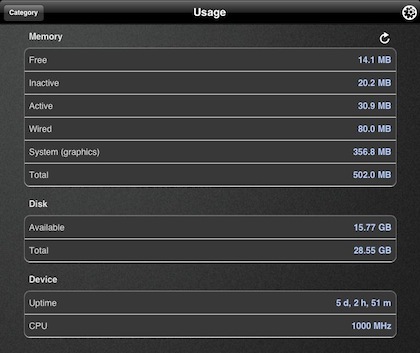 It isn’t that we doubt Apple and their memory management or that developers are doing anything wrong. But, history tells us that problems always happen at the most inconvinient times. We have been working with an app that will perform a memory clean up for us without having to restart our iPads. XSysInfo clears things up in seconds so even if we are sitting at the table being asked to present when we hadn’t planned to, we can get the memory cleared up. Many folks are reporting it’s a must for big gamers too… but what would us serious workers know about that?! Simply launch XSysInfo, view where you memory is being used, then hit the refresh button (upper right). You can see the below and after here. Wired: Wired memory is information that can’t be cached to the disk, so it must stay in RAM. The amount depends on what applications you are using. 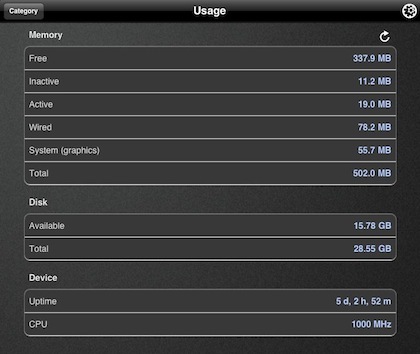 Active: Active memory is currently in RAM and actively being used. Inactive: Inactive memory is no longer being used and has been cached to the disk. It will remain in RAM until another application needs the space. Leaving this information in RAM is to your advantage if you (or a client of your computer) come back to it later. Used: Used memory is being used by a process and is not immediately available. Free: Free memory is not being used and is immediately available. The app is universal so you can run it on both your iPad and iPhone, with user interfaces designed for each. 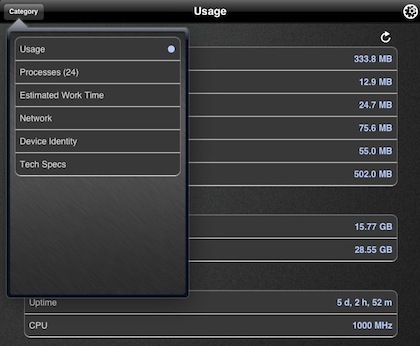 XSysInfo does do more than just clear up memory, it is also a good source of information on the network your iPad is on, how long the current charge of the battery will last (web browsing on WiFi vs 3g vs watching movies… etc…), traffic and Apple info on iOS devices. Update: Several folks have reported that they just can’t clear up more available memory. A step we didn’t mention that you will want to remember is clearing out the multitasking bar of recent run apps. Double tapping on the ‘home’ button results in a list of apps across the bottom of the screen that were recently used. A great way of getting to apps quickly without having to move between screens and folders. If you hold your finger on any of these icons, you will go into the edit mode just like if you had done the action on any icon in the normal launcher windows. Tap the ‘-‘ on the apps in the multitasking apps bar will remove them from the bar but will not impact the actual app. This has a large impact on freeing up available memory.